SPECIAL! $18.35	The Women’s Health Big Book of Exercises: Four Weeks to a Leaner, Sexier, Healthier You! This true story of an epic courtroom showdown, where two of the nation's largest corporations were accused of causing the deaths of children from water contamination, was a #1 national bestseller and winner of the National Book Critics Circle Award. Described as “a page-turner filled with greed, duplicity, heartache, and bare-knuckle legal brinksmanship by The New York Times, A Civil Action is the searing, compelling tale of a legal system gone awry—one in which greed and power fight an unending struggle against justice. Yet it is also the story of how one man can ultimately make a difference. Representing the bereaved parents, the unlikeliest of heroes emerges: a young, flamboyant Porsche-driving lawyer who hopes to win millions of dollars and ends up nearly losing everything, including his sanity. 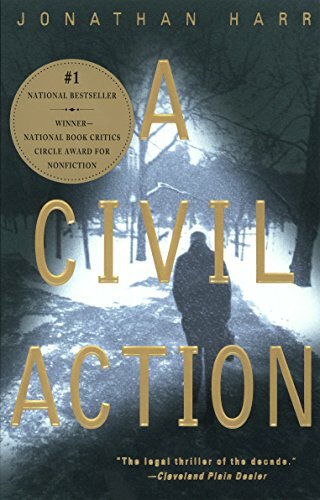 With an unstoppable narrative power reminiscent of Truman Capote’s In Cold Blood, A Civil Action is an unforgettable reading experience that will leave the reader both shocked and enlightened. A Civil Action was made into a movie starring John Travolta and Robert Duvall.